Seeing as how you started it all with your editorial of last October you might as well share the laughs. The letter, transcribed below in its entirety, was, by an odd coincidence, received by me on the same day that I picked up the June issue of Analog, in which my own letter was printed. Read it and weep! 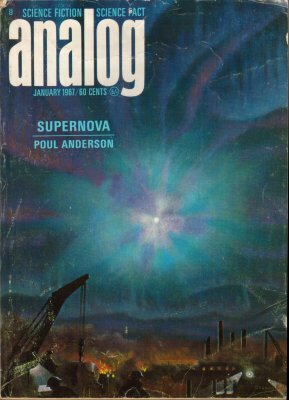 You realize, of course, that pulp magazines constitute the crassest possible junk - comics, True Confessions and 98% of all science fiction ever written - the sort of stuff illiterates and engineers devour. The preceding factual statement is not too "lit'ry" for you to understand, I trust? Any man who supposes that Edgar Rice Burroughs was the greatest SF "craftsman" (I won’t dignify him with the word "writer") of all time could not be expected to think much of college graduates, poets, or, indeed, anybody who can speak in words of more than one syllable. I can only assume you never got past the sixth grade yourself - and proud of it, by damn! And what were those jobs you held out there in the world which qualified you to write? Ditch digger, short-order cook, carny barker, hired farmhand, janitor, delivery boy, waiter, stock-room clerk, truck driver? Then you settled back, did you, to begin competing with Heinlein and Stanton A. Coblentz? Your friend in England - What did he do to deserve your ridicule? Go on to grad school? - must have seen you were making a little money; naturally he wanted to get some gravy himself. Offer your services (such as they are?) to a friend? Oh, no! Push his face in for him? You bet! Euclid knows I'm no science-fiction writer. I only read it - the 2% that’s written for me - "The Stars My Destination," "The Man Who Lost The Sea," "The Man In The High Castle," "Go For Baroque," "Gladiator At Law," "Against The Fall Of Night." Funny thing about those stories. They’re quality. Not just because I say so, too. And that puts them way out of your league, buster. You’ll probably dismiss this whole rebuttal as "precious" trivia. I reckon I gotta expect that when arguing with a bigot. P.S. "Would you buy it for a quarter?" Written on back by Susan: No comment necessary. Please do NOT answer. Sorry to disappoint you, but I see eye-to-eye with you on the books and authors you mention-with the exception of Stanton A. Coblentz. And I'm sorry, too, to have to tell you that actually I'm unqualified to write. I've worked at only one of the glamorous trades you cite-short-order cook - although I suppose I could equate "kennelman" "hired farmhand." Fantastic, ain't it? Not a typical reader of Analog, I hope. Certainly not one of my faithful readers; he didn't even read my letter in the magazine correctly. Actually, I'm rather peeved - but only because Susan deals with all my business (and, but rarely, fan) mail in my absence, and that uncalled-for diatribe somewhat shook her. Definitions: A bigot is one who can see things in only one way, and is so sure of it he won’t argue. A fanatic is one who can see things only one way and sets out to make every one else agree. Your correspondent was not a bigot.